Welcome to bagustris' GitHub Pages. This is my Github page made with automatic page generator. This page contains list of my research including the public source for academic purpose. For the full list, you can click "View On Github" in the top left or access my other blogs at Blogspot, Wordpress and My Tumblr. 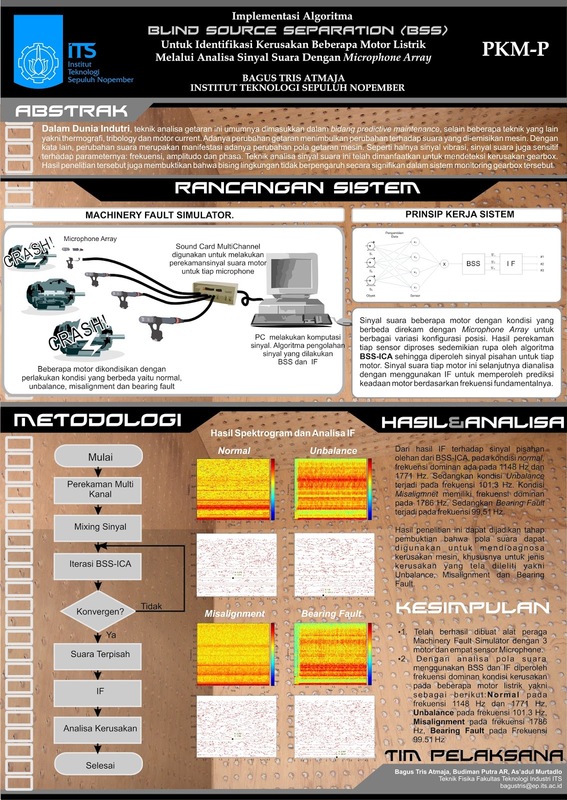 My bachelor thesis is about implementation of sound sources separation by utilizing independent component analysis for machinery fault detection. I used the simple ICA method using natural gradient algorithm to get separating filter and then by using fundamental frequency estimation via instantaneous frequency I classified the pattern of normal/abnormal machine. The following poster is part of my bachelor thesis, i.e. presentation of Student Creativity Program (PKM) in Indonesia, 2008. You can grab my bachelor thesis code here, including pdf of the report in the readme section. In my master degree, I continue my research, still about source separaton, in more specific theme namely binaural sound separation, a separation method inspired by binaural human auditory processing. In this research, I compared some common method on binaural source separation, from the binaural model by using phase difference channel weighting proposed by Kim et al. from CMU, ICA, ICA with binary mask, FastICA and finally my-proposed-method FastICA with binary mask to accomodate the lack and benefits of previously mentioned methods. The source code, including the pdf report in readme section, can be grabbed via github in the following line. I will update and fix bugs if there is needed. Below is a poster of some works on my master study. Currently I am still struggling to find PhD position. 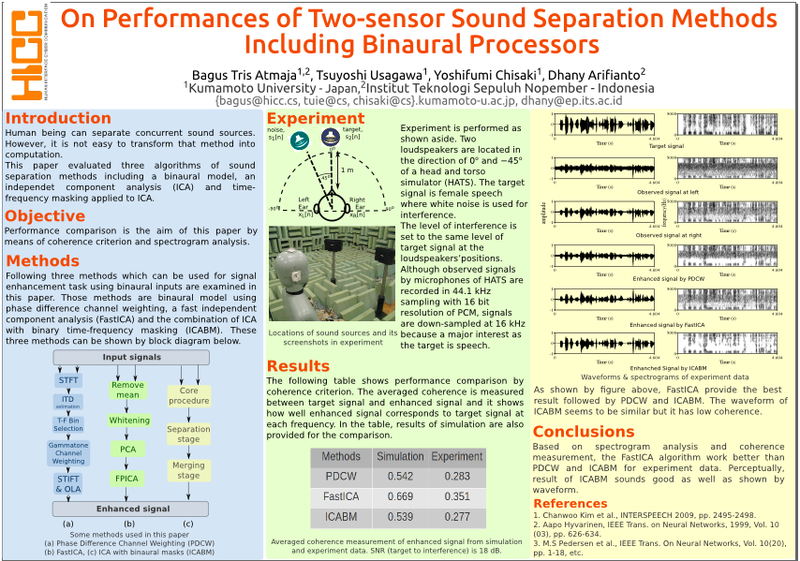 Hopefully, I can take PhD in the same theme with my previous research theme, acoustics and signal processing, especially in the field of sound sources separation. Should you have any information about PhD position in this theme, feel free to contact me at: bagustris AT yahoo DOT com. Alhamdulillah, finally I got MEXT scholarship to conduct my PhD study at JAIST. I will update my PhD log on my blog bagustris@/home.